The morning of Nov.11th. a large 8pt. buck that I had been hunting for was rubbing a tree in thick cover 40 yards away.As the beautiful buck headed in my direction I mentally prepared for the moment of truth. As the buck entered the shooting lane I drew back, and as he cleared I bleated and he stopped with his shoulder slightly back and I picked a spot and released. To my delight the arrow went exactly where I wanted it! What I didn't know was he was slightly quartering to me. I called my tracking partner and an hour later he showed up and picked up what I was certain to be a short blood trail. 200+ yards later,the blood trail ended, and I thought, this cant be happening to me. After several hours of frantic grid searching, my buddies and my wife went online and gave me Rob's phone number. 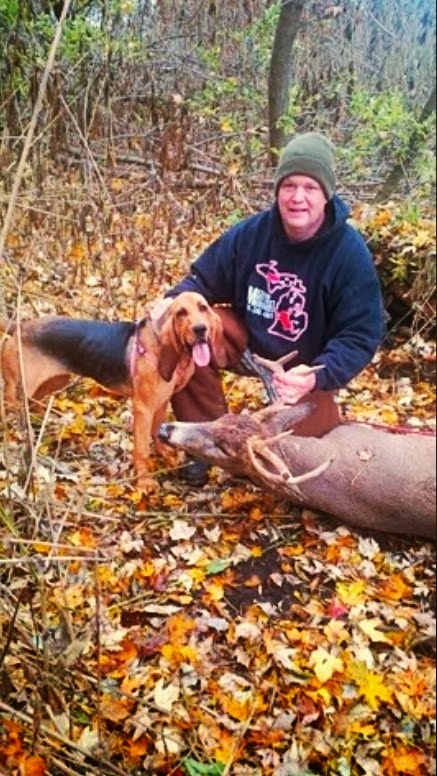 Realizing the deer was dead but we had no idea where, I knew a tracking dog was the best solution to recover the buck. Rob agreed to make the trip to Bad Axe. And when he and scout arrived at 5:15pm I thought to myself, how can a dog that small track a deer? Little did I know what this dog was capable of! We proceeded to the middle of the blood trail and scout quickly picked up the trail. The blood was very scarce but scout followed it through 3 property lines which consisted of woods,CRP,and a small marsh! We had tracked about 700 yards. When we approached very thick woods, Scout picked up the pace and Rob said the deer would be close. Suddenly Scout jumped the deer getting within inches before got up! In order to better analyze the der, Rob asked me to keep up and see how far he goes. To our amazement the buck back traced exactly back to where he had come from. After following 200 yards, we again jumped the buck and could see he was really hurting.At this point the decision was to go home and come back in the morning. 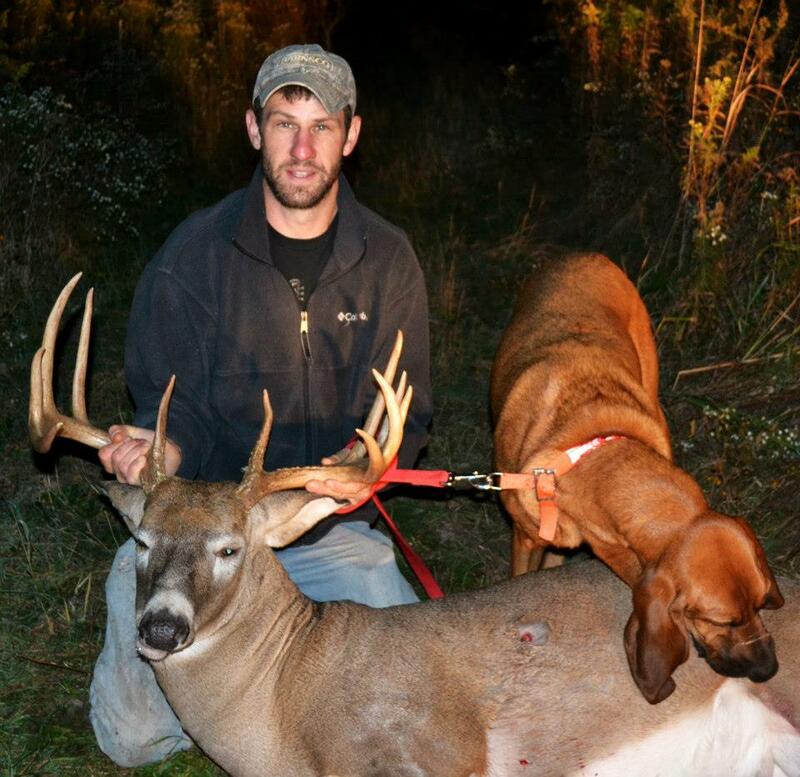 The next morning Scout easily picked back up on the trail and the buck continued almost the same path he had left on! After 250 yards we found several beds and Rob stated,"He will be close." Scout followed the trail like a champ and we got back up near the woods where the chase began. The deer made every effort to confuse the dog by circling and doing figure eight. At that point I started to get concerned again. Scout however, expertly followed the buck and 100 yards later, we found the buck expired!Field dressing revealed a single lung/liver shot. 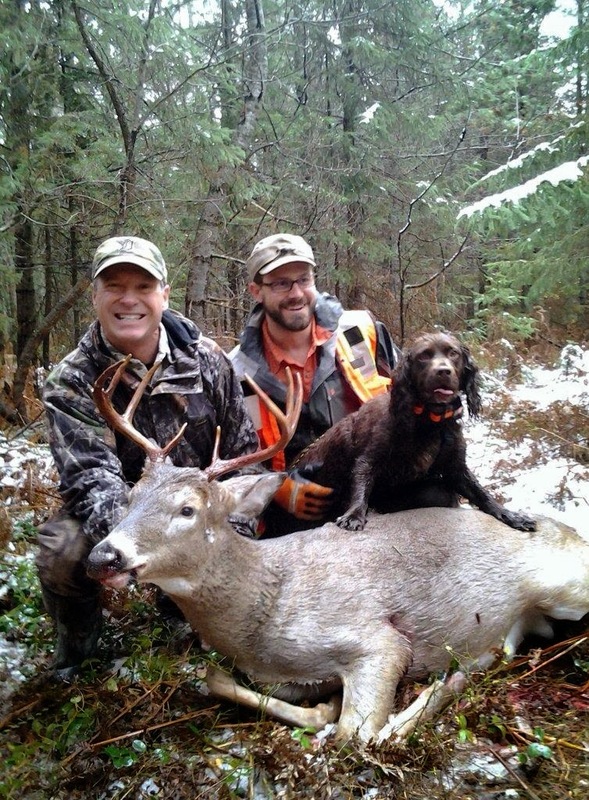 Without Scout, this deer would not have ever been found. I am so great full that Scout and Rob found my trophy. The 1,300+ yards the deer covered with no blood trails is a testament to the quality of this team. 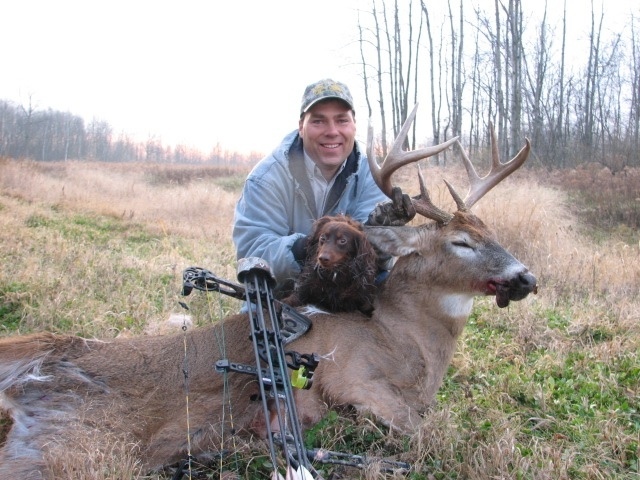 Rob was very professional and Scouts' desire to find the deer was relentless! I am so grateful that God brought Scout and Rob into my life. This was an adventure none of us will ever forget! LET THEM GO! SO THEY CAN GROW!